Here's a dish every Indian kid has grown up eating. There's so many variations of the Onion Bhajia. They are basically onion rings or onion strings but with spices and a different type of batter. 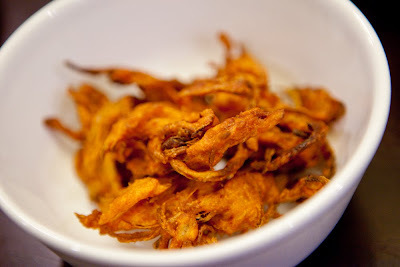 And Just like onion rings/strings, onion bhajia should be eaten while they are hot. Depending on which part of India you're from, some call is pakora, some call it bhaji and we gujarati's called it bhajia. It's usually made as an appetizer or even as an afternoon/evening snack to be eaten with some masala chai (tea). It's crispy with a little bit of spice, sweetness and sourness. You can never get enough of this. Once you start eating, it's just so addicting! 1) Cut onion into half and slice it into thin slices. Separate the onion slices and put them in a large enough bowl. Toss in the rest on the ingredients and mix well. The mixture should be dry with a little moisture from the lemon and onions. Taste the batter a little to make sure there is enough seasoning. 2) Heat some oil and using you hand, scoop some of the onions and sprinkle them into the hot oil. Be careful not to burn yourself. Fry them at medium hi heat until golden brown. Remove from oil and serve hot. Enjoy!! Girl you are right about bhajia being addicting! My favorite are these and marcha na bhajia!